Yesterday Electronic Arts, the publisher of mecha first-person shooter - Titanfall, - announced a lot of new information about its project, finally revealing Titanfall release date and presenting game’s Collector's Edition and fresh gameplay trailer. Thus, according to the publisher, Titanfall release date is March 11, 2014 in North America for such platforms as PC, Xbox 360 and Xbox One, and Europe will get this shooter two days later - on the 13th of March. 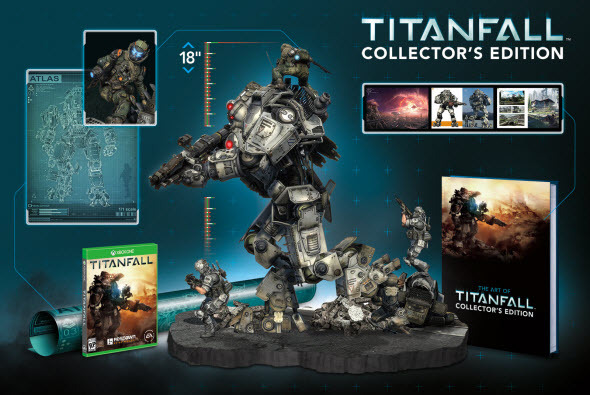 In addition to the game's release dates, EA has presented Titanfall Collector's Edition, which costs nearly $250. It’s expensive enough, isn’t it? For this amount of money the developers and the publisher of the project offer us 18" hand-crafted Titan figurine with diorama and battery powered LED lighting, the hard cover art-book with the rare concept arts (190 pages), the exclusive poster with the picture of Atlas titan and, of course, the game itself. If you would like to have all these bonuses and you do not mind to pay such a sum of money for them, then you can pre-order Titanfall Collector's Edition right now at Game. Also EA in collaboration with Respawn Entertainment has shown us a fresh Titanfall gameplay trailer, which is called "City of Angels". Here you will see, which is not surprising taking into consideration the genre of the game, a lot of shootings, multiple weapons and locations. So enjoy!